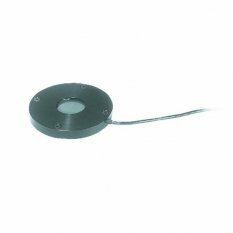 The L30A-10mm is a thin profile thermal power/energy laser measurement sensor 10mm thick with a 26mm aperture. It can measure from 80mW to 8W free standing and 30W when heat sinked. It can measure energy from 20mJ to 60J. It has the spectrally flat broadband coating covering the spectral range from 0.19 to 20um. The sensor comes with a 1.5 meter cable for connecting to a meter or PC interface.